Create your shows unique look and feel various shell scheme stand options, lighting and power articulation, carpeting options, custom stand builds, signage & graphic layouts, furniture hire items, and a number of project management services. The creative team will conceptualise a design and oversee the construction by the custom stands department. Custom stands are designed specifically around your products and services setting you apart from your competitors. Inquire about our range of hire equipment including LCD screens, microphones, PA and sound equipment, and projection screens. Create the right environment at your next exhibition, event or conference. 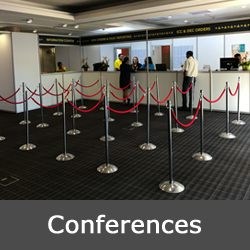 Our team is able to design registration counters, catering stations, directional signage, offices, meeting rooms, media centres, and pavilions. Shell scheme stand packages can be tailored to suit the nature of your exhibition requirements. Exhibition Stands & Events is a South African owned and operated exhibition and events infrastructure, company. Exhibition Stands & Events has world class products and services to help you deliver a successful exhibit every time. Browse through our catalogues of shell scheme package stands, lighting and power products, flooring options, custom stand builds, signage & graphic layouts, or furniture hire items. Learn how to enhance your exhibition stand to maximum effect. All our products and services are under one roof which allows us to produce the ideal mix of products and services. The design team provides 3D drawings, floor plan layouts, graphic design, and branding activations. On-site staff are proficient in using the Octanorm® aluminium system. There are numerous profiles in our stock, creating unique stand designs. Our qualified electricians specialise in the installation of temporary power systems in any venue, including the installation of generator power. We offer temporary carpeting solutions on a big scale. Specialized flooring can be fitted with a laminate system and raised floor option. This service specialises in the delivery of custom built stands in both Octanorm® and conventional shop fitting. The graphic department offers a selection of printable substrates. The experience of this service is crucial when it comes to rigging and application. We have an extensive range of furniture and accessories for hire. Select from designs that are both functional and attractive. This service brings all elements of your event or stand together, and the assurance that the project will be delivered on time and on budget. Staff comply with the safety requirements & ensure that all of our clients’ exhibitions or stands are built with all the relevant safety certificates. We have the qualified staff to provide all of the necessary safety certificates currently required by all venues. Have a look and learn more about how we have delivered results on projects ranging from stand enhancements and custom builds, to trade shows, and international exhibitions across South Africa. Trade shows can be a great opportunity to network and market your business but it can be tough standing out from the crowd. Here are our most effective ways to exhibit and engage with customers. Exhibiting is a cost effective way of getting your products and services in front of customers. Work with an experienced exhibition company to bring your ideas to life. Make sure your stand design reflects well on your company. Interact with potential customers using all five senses. Train staff who will be promoting your products and services on the exhibition stand. Staff need to look and feel fresh. Use a competition to engage with customers through social media or websites. Advertising within the trade show must be visually clear and precise. Get to know your potential customers to provide personalized service. Gather contact details and information to follow all possible leads. Book early for next year. It is important to take into account that the more often you exhibit at the same event, the more likely you are to achieve brand awareness, and the more repeat customers you will have. Exhibiting is an opportunity to not only build on new relationships, but to also expand on current. 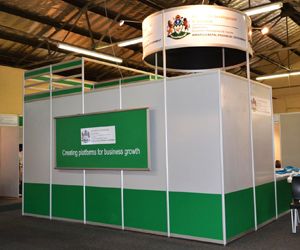 Exhibition Stands & Events is proud to be an exhibition services provider to a broad set of show organizers, corporates, associations, and government departments, across South Africa. Exhibitions can be wasteful and environmentally unfriendly. The efforts of the show venues and stand designs are creating a more sustainable environment. At Exhibition Stands & Events we aim to be more efficient in our use of materials and recycle waste to help minimise landfill, reduce carbon emissions and improve our environment. Exhibition Stands & Events is one of South Africa’s leading suppliers to the industry and provides a range of quality products and services including stand and floor plan design, Octanorm® shell scheme, electrical infrastructure, flooring and carpeting solutions, custom stands, signage and graphics, furniture hire, and project management. 46 Brickhill (Sylvester Ntuli) Road, Durban, 4001.